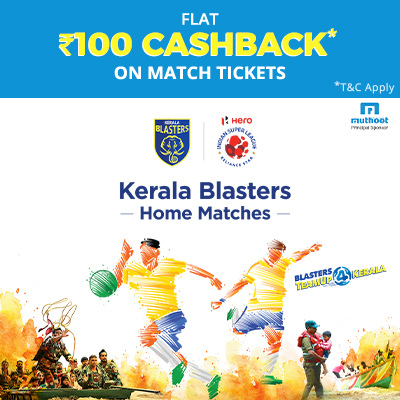 Get Flat Rs.100 cashback on purchase of Kerala Blasters Home Match Tickets. Promocode is valid on a minimum booking of 3 tickets. Buy Kerala Blasters Home Match Tickets on Paytm & get flat cashback of Rs.100. * The promocode received post purchase of this deal is only applicable for booking tickets to Kerala Blasters Home Matches on Paytm.com and Paytm App. * The promocode will be applicable on a minimum booking of 3 tickets to Kerala Blasters Home Matches on Paytm.com and Paytm App only.